This month’s family fun ideas are dedicated to all things maker. A maker, of course, is anyone who makes something, and they are on the rise. From maker spaces, where collaborators young and old share equipment and expertise, to Hacker Scouts dedicated to solving problems through making, there are lots of opportunities for creative building and problem solving. To encourage young makers in your home, try some of these ideas. 1. Visit the Explore DIY website for maker-startup ideas. 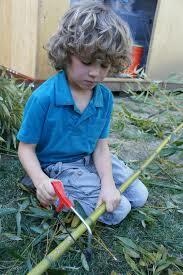 You might explore things to make with duct tape or examples of homemade stop motion video. If you get excited about video, move to the “Skills” area and tackle one of the 12 animation challenges. Of course you can always check the Skills area to become a Duct Tape Ninja, as well! 2. Would you like to see an 11-year-old maker at work? Visit the world of Sylvia’s Super-Awesome Maker Show. Here’s an example. You can also can click to read the posts at Maker Magazine, which makes it a bit easier to follow the directions. With Sylvia you can make squishy circuits, light-up toys or etched copper circuits. You can also suggest new topics for her show—or create your own. 3. There are lots of things you can make with things you have around the house. How about a sock puppet? 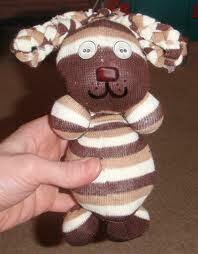 Or a no-sew sock doll? Or a no-sew stuffed puppy? (I’m going to try that one next time I visit young friends!) Of course learning to sew is also an excellent maker skill. 4. I don’t know if makers consider food preparation making, but we do in our house. Of course if you actually want to build with cans of food, check the amazing feats of Canstruction. But really, what could be more important than learning how to make real food? Make some jam. Make bread. Make a pie. Challenge yourself to create a soup from whatever is in your refrigerator and pantry. Make a dish from the land of your ancestors. Make something you’ve never made before—but make it together. 5. A Maker Faire is a gathering of makers, displaying their creations. Perhaps you’ll be able to find a Maker Faire near you. 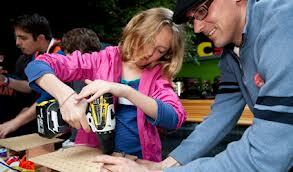 But wouldn’t it be even more fun to plan a mini-maker faire right in your own home or neighborhood? It doesn’t matter if you like to knit, build robots, make wooden toys, or create things from cardboard boxes. Gather your friends, pick a date, and plan a neighborhood festival. All you need is some tables, some imagination, and some willing participants. (Oh, and maybe some delicious treats you learned to make under #4.) Perhaps some adults might be willing to teach some sewing, woodworking, or electronics skills to help you get started. (And, of course, you can get ideas from Sylvia!) Think now about the excitement you can have once your summer break begins. If you send us a photo I promise to post it.